We are not one of those fly by night companies that are so common on the Internet. AHW has represented the John Deere product line since 1932. We operate ten John Deere stores in Illinois surrounding the Chicago metropolitan area to the south and west and down thru central Illinois. 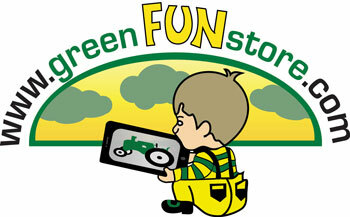 Due to tremendous growth, in September 2006 GreenFunStore.com was moved from our Watseka, Illinois store into its current location at 110 S 2nd St Street, Watseka, Illinois. Thanks to this move to a dedicated warehouse facility we were able to double our offering of John Deere licensed products. We continue to add John Deere items on a weekly basis. We hope that our selection of John Deere products meets your needs today and into the future. If you know of a John Deere item and would like to see us add it to our product line, please e-mail us. We will try to accommodate your wishes. In the beginning we only offered John Deere toys by Ertl. The requests for additional John Deere licensed products came pouring in. Most people told us that they could not find John Deere products on the Internet or that the products that they did find were overpriced. It was at that time, that we decided that we needed to become the place to go on the Internet for any and all John Deere products. We now carry between 2000 and 3000 different John Deere items in stock at all times.Take your time looking around, as we would hate for you to miss some of our varied and unique items.